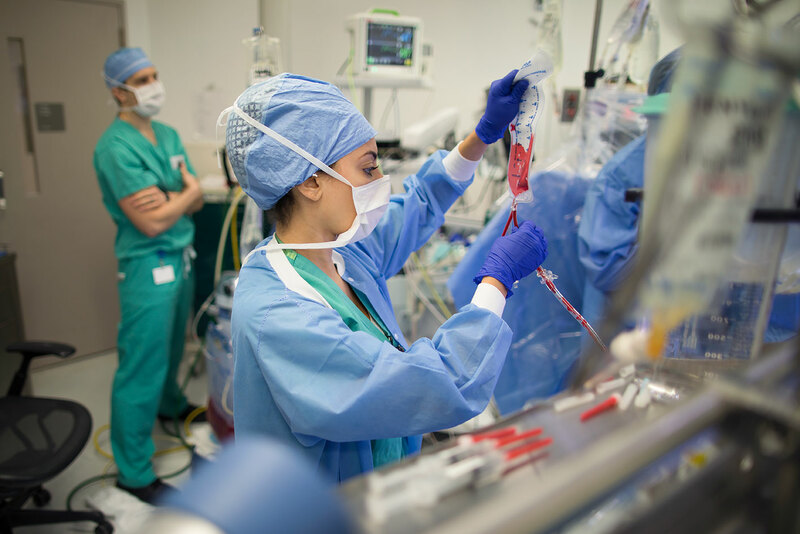 A Mount Sinai perfusionist operates the heart lung machine during a mitral valve repair surgery. Transfusion of red blood cells is a common practice in patients undergoing open heart surgery. While multiple safety mechanisms have been put in place by our blood bank to ensure our patients' safety, there are still numerous risks associated with blood transfusion. Our team utilizes the following strategies to reduce the amount of blood transfusions given to our patients. Looking at our data over the last few years we determined that only 15% of elective mitral valve surgery patients required a transfusion of Red Blood Cells (RBC). Almost all patients who receive a transfusion had a starting hematocrit under 35%. Hematocrit measures the amount of red blood cells in whole blood. In most patients, a simple iron supplement will raise their hematocrit greater than 40% which could prevent the need for a transfusion. If you are concerned about receiving a blood transfusion we recommend you have your General Practitioner or Cardiologist test your hematocrit. Our Anesthesiologists can work with them to raise your level. The heart lung machine requires approximately 1.5 liters of electrolyte fluid to fill all tubing and reservoirs of the pump. This fluid is referred to as priming volume. Patients with mitral regurgitation frequently have a larger than normal blood volume. We use this to our advantage. Prior to being placed on the heart lung machine, we remove a portion of the electrolyte solution and replace it with the patient's own blood. This reduce the dilution effect that the priming volume has on the hemoglobin level. This technique is call retrograde autogolous priming (RAP). During mitral valve surgery our Perfusionists salvage lost blood using a Cell Saver autologous blood recovery system. The Cell Saver processes the blood and at the end of the surgery, the Anesthesiologist transfuses the salvaged blood back to the patient. We do not recommend autologous blood donation for most of our patients. Approximately 85% of elective mitral valve surgery patients at our institution will NOT require a blood transfusion during their mitral valve repair procedure. While the risk of transfusion related complication is greatly reduced by predonating ones own blood it will never by zero. Therefore, we feel strongly that the risk benefit ratio does not warrant this technique.